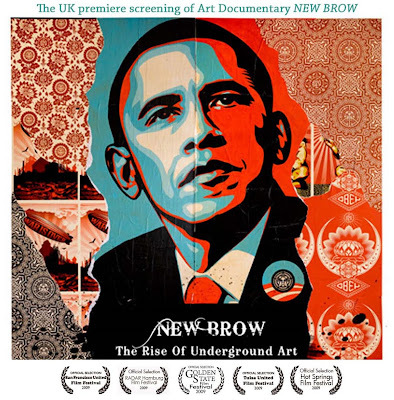 London Miles Gallery is proud to host the premiere UK screening of Contemporary Art documentary, New Brow – The rise of Underground Art, a feature film presented by Humble Pictures in association with The Shooting Gallery from San Francisco, California. The documentary features some of today’s most influential and groundbreaking artists from the New Contemporary Art movement, such as Shepard Fairey, Ron English, Silvia Ji, Gary Baseman, Shag and many more, who speak openly and enlighteningly about the growing art movement and its origins. The documentary not only includes first-hand accounts from an impressive list of pioneering artists, but also showcases the important galleries and collectors who adopted, and continue to drive the New Contemporary Art movement today. Saturday the 20th of February at 4:00pm and again on the 27th February at 2:00pm and 5:30pm. Tickets are £8.00 and the film will be shown in the Project Room in Westbourne Studios. Please purchase advance tickets at www.londonmiles.com, or reserve by email to info@londonmiles.com.